Brits Mick Extance (Honda Europe Dakar Sport) and Stanley Watt (KTM Front Row GB) proved their credentials on the hardest day of the 2009 Dakar so far with impressive results. Dakar veteran Mick Extance finished the gruelling 506KM Special in 7h 51m 57s to post the 21st fastest time, moving the 44 year old up to 24th overall. "This year I am out here to race and not just finish. From the first time I saw Dakar on TV, at the age of 17, I wanted to race here. I always felt the top 20 is doable, and that's my aim. "In the dunes today we rode full speed, and after I jumped over a dune I did not dare to look back. Luckily I didn't have too many other adventures today". Fellow Brit Stanley Watt put in yet another strong performance finishing the tough stage in 26th place, which escalated the 37 year old in to 21st place overall with five days completed. The stage was won by American Jonah Street onboard his KTM. Street finished second on stage four and is proving that despite not having the same level of technical backing and support as his factory rivals he has the speed to match them especially on the more technical stages of the event. The 36 year old holds second overall in the standings 27m 12s behind leader Marc Coma. Street said: “I’ve been dreaming of winning a stage of the Dakar for a long time and it happened today. Leader, Marc Coma had his worst day of the Dakar by far finishing in an uncharacteristically low ninth position - 15m 45s off the pace. The factory Repsol KTM rider suffered a puncture, but still stays in control on the overall standings. He said: “I was riding very slowly in the stony ground but I still got a puncture just 60 kilometres after the start. "Jordi (Viladoms) started 10 minutes behind me this morning, and I knew he would be along soon, so I took my wheel out and started repairing it while I waited. When he came along we quickly swapped wheels and off I went again. BMW man Simon Pavey has significantly upped his pace over the last two days and did that again on day five with an impressive 46th place finish. The 41 year old Australian who runs the UK’s BMW off-road school is now 45th in the overall standings. Gary Ennis (KTM Team Dakar Ireland) claimed his best finish of the Dakar so far in 88th with Ewan Bucham (KTM Desert Rose Racing) 106th and Craig Bounds onboard his smaller KTM 525 in 123rd. 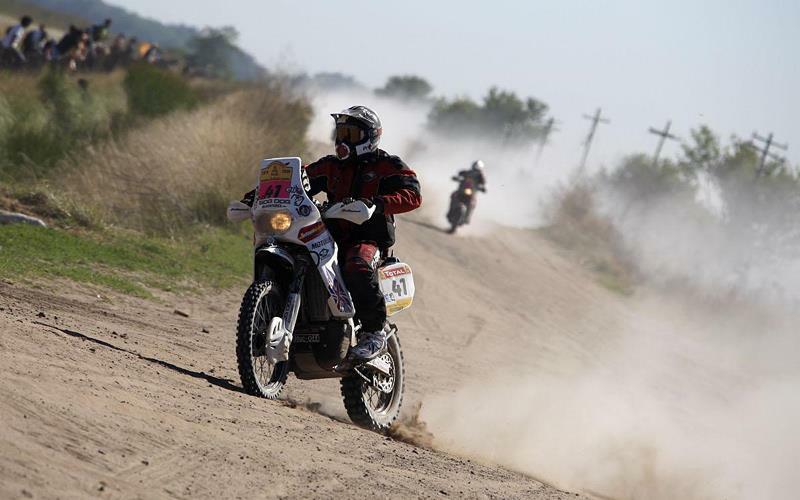 Jonathan Stamper (KTM Front Row GB) became the first British rider to withdraw from the Dakar. The 43 year old became one of 55 riders to retire from the 2009 Dakar after the opening five stages. Day six will see competitors arrive in the foot hills of the Andes Mountains at Mendoza after a 76KM liaison, 395KM Special and a further 154KM Liaison. Before they reach their destination they will have to navigate extensive sand dunes and numerous river crossings.